I got this press release from Budjette Tan in the mail today! 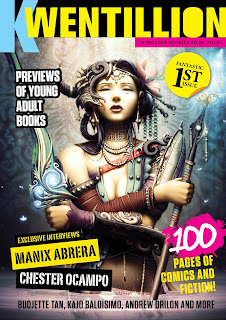 Summit Media is proud to announce the launch of Kwentillion Magazine, on May 26, 2012, at the Summer Komikon at the Bayanihan Center, Pasig City. The magazine shall be available at the National Book Store booth. An onstage presentation by co-editors Budjette Tan and Paolo Chikiamco shall take place at 3:30 p.m.
Kwentillion will be the country's first publication dedicated to young adult literature and media, featuring young adult - themed comics and fiction by Filipino creators. Eventually intended for release every two months, the black and white magazine --with an eight-page colored spread every issue--will feature comics and fiction that embrace the themes of the YA genre, as well as articles which tackle YA book releases, and issues relevant to the YA fan community. The first issue of Kwentillion features the first mass market distribution of four well regarded comics: "The Last Datu", a tale of a daughter's vengeance in a fantasy world, by Budjette Tan & Kajo Baldisimo; "Poso Maximo: A Fair Trade", where a veteran plumber battles monstrous sanitation threats, by Robert Magnuson; "High Society", a steampunk tale set in the eighteenth century Philippines, by Paolo Chikiamco and Hannah Buena; and "Skygypsies", by TJ Dimacali and JohnRay Bumanglag, a science fiction story featuring the Sama-Laut. Kwentillion also features interviews with Manix Abrera (Kikomachine Komix) and Chester Ocampo (who provides the cover art), as well as a column by Tarie Sabido, a prominent YA blogger who has been a judge both for the National Children’s Book Awards and the international Children’s and Young Adult Bloggers’ Literary Awards (CYBILS). Kwentillion Magazine shall also be available at selected National Book Store outlets at the price of PHP150.00. For more information please feel free to visit the Kwentillion Facebook page at http://www.facebook.com/Kwentillion.